Guns and gun rights have been in the news a lot lately. The question raised is whether guns or people are to be blamed for gun violence. Guns are inherently neutral. They are tools to accomplish goals. People determine whether the intent of the gun user to accomplish some goal is reasonable. For example, Hunting seasons and the military are examples where reasonable intent warrants the use of guns according the to United States government. Imagine the scene in Disney’s Aladdin where a person steals an apple. The intent determines whether the person’s hand, which is the tool used to commit the crime, should be chopped off or spared. Do you perceive the person to be committing a crime? Then chop off the hand. Do you perceive the person to be doing what is necessary to meet his most basic of survival needs? Then spare the hand. The hand is not to blame. It is a tool to accomplish a goal. The same argument can be applied to stereotypes. Like guns, stereotypes are not inherently negative. Stereotypes are tools. People decide what intent warrants the use of that tool. The problem, though, is that the intent is not necessarily easy to know or understand. 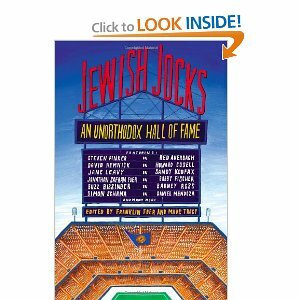 In the title Jewish Jocks, the stereotype is funny, ironic, and interesting. If you perceive the intent of using this stereotype in the title as entertainment and enjoyment, then there is no problem with selling or buying a book with a stereotype unapologetically in the title. If you perceive the intent of using this stereotype in the title as providing an opportunity to bolster sales on the backs of Jews who are being promoted disparagingly as unathletic, then work towards discouraging people from buying this and similar books that use stereotypes in their titles. Stereotypes aren’t the problem, then. It’s the use of the stereotype that is the problem. It’s the use of the hand. It’s the use of the gun.